AND WE HAPPILY HALLOWEEN'D | jeni a.
Aaaand Olivia and I can have twinning facial expressions. These photos semi-baffled me...like mother like daughter! We two had a fab Halloween night going as Rosie the Riveter. You can't go wrong by representing the strong, go-get-'em woman! We're so hoping that next year, for the first time in our whole marriage, that Ryan will party with us on Halloween night. He's always been scheduled to work, our man (talk about "go-get-'em" for real)! 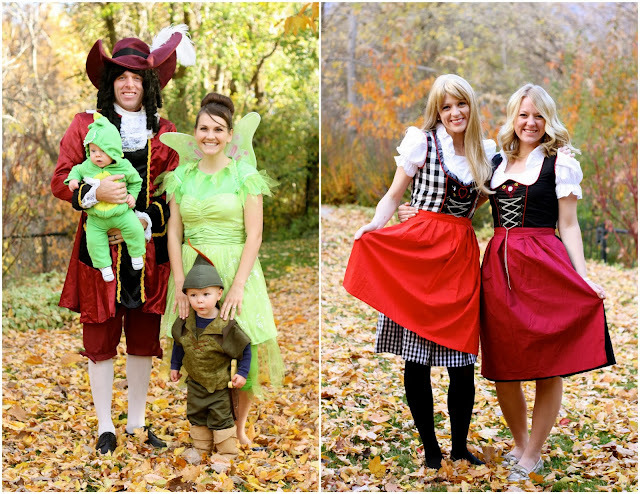 Hook, the croc, Tink, and Peter ...and the damsels in dirndls. I love the costumes! Olivia is such a joy! Oh Lisa, I miss you! Really really badly - in the good kind of way. Love seeing the girls via your blog. Keep 'em coming.